A collection of illustrations based on military and historical themes. Original drawing completed in pencil. Image then scanned in to PSE and digitally coloured. 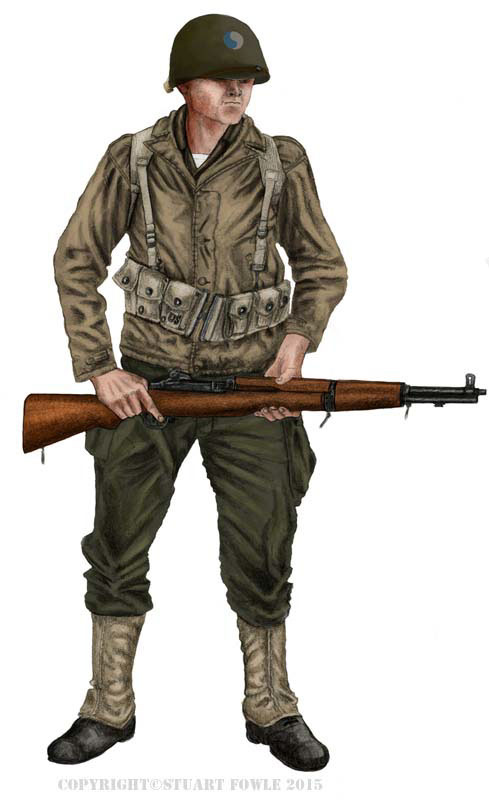 The illustration depicts a WW2 US Infantry soldier from the 29th Infantry Division, June 1944. Original drawing completed in pencil, and then scanned into Photoshop Elements for digital colouring. WW2 US Tank Crew, circa 1944/1945. Original drawing completed in pencil, and then scanned in to Photoshop Elements for digital colouring. WW2 US Infantry, circa 1944/1945. Checking his M1 Garand one more time before setting out on a long patrol. Original drawing completed in pencil, then scanned in to Photoshop for colouring and adjustments/corrections. German SS Schütze wearing a 1944 getarnte Feldbluse with Erbsenmuster camouflage. He is armed with a Mauser Kar 98K rifle with a Model 24 Stielhandgranate stuffed in his belt. His webbing is the standard 'Y' straps. The handle of his entrenching tool, can be seen hanging from his left side. 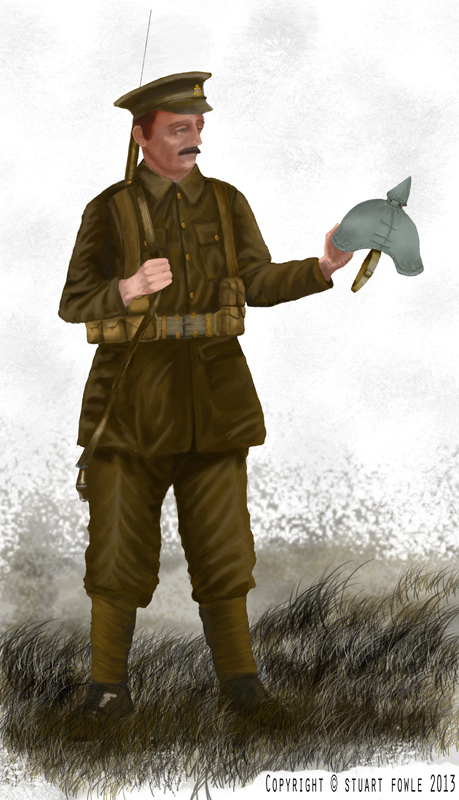 Digital painting of a British Infantry soldier in August/September 1914, during the early battles. He is examining a German picklehaube, that has been abandoned after a skirmish between the 2 sides. He represents a private soldier from the Devonshire Regiment. German Fallschirmjäger circa 1943/44. Original drawing completed in pencil, then scanned in to PSE for colouring and adjustments. 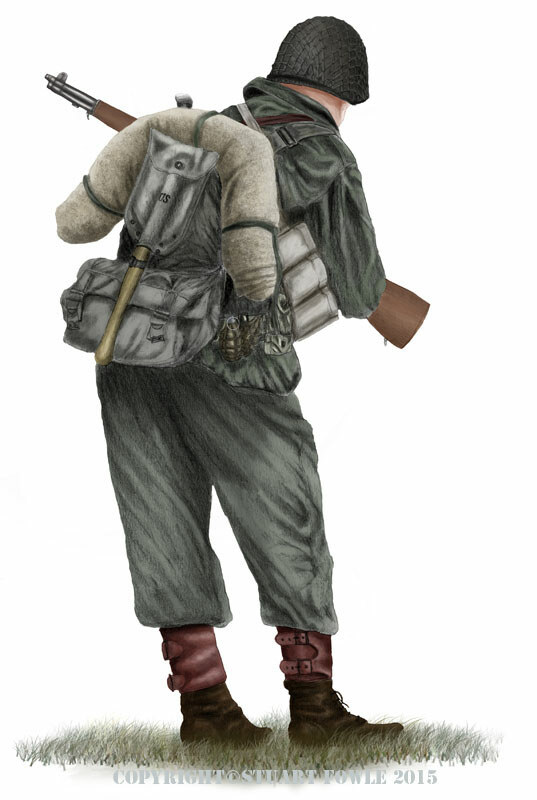 Typical British Infantry man circa 1944. 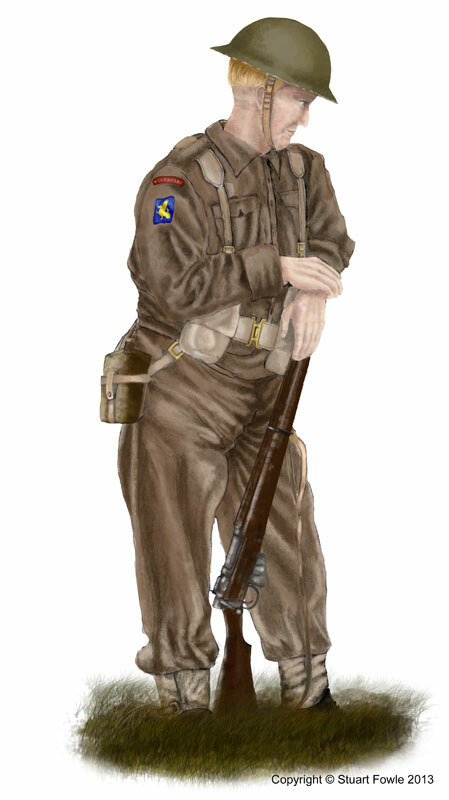 Digital painting depicting a 'Tommy' from the 43rd Wessex Division, The Wiltshire Regiment, somewhere in Normandy Summer of 1944. 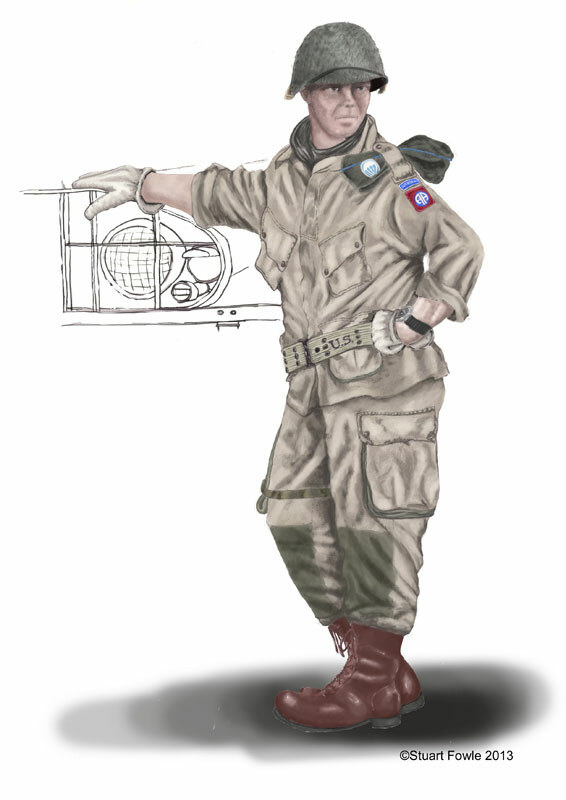 Digital painting of US 82nd Airborne Paratrooper, circa 1944. Hand drawn, then scanned in to PSE9, and coloured. 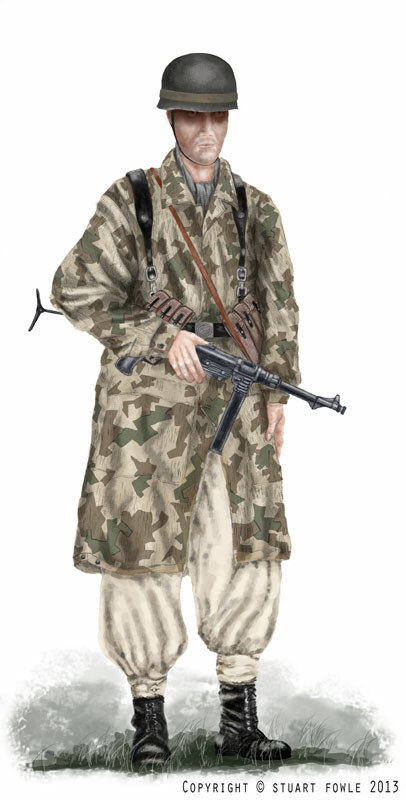 Soviet Infantry from WW2 wearing the Amoeba Camouflage, all in one suit. Armed with the PPsh 41 sub-machine gun. Hand drawn using colour pencils, and then enhanced in Photoshop Elements. Graphite drawing of a Norman Knight circa 1066, on his rearing horse. Poland, September 1939, attaked by Nazi Germany, let down by her allies and stabbed in the back by the Soviet Union. The Polish Army and Airforce did it's best to stem the onslaught from the Germans and then the Soviet Union. However the Luftwaffe soon had complete control of the skies over Poland and the clear summer skies gave advantage them the and the Polish nowhere to hide. 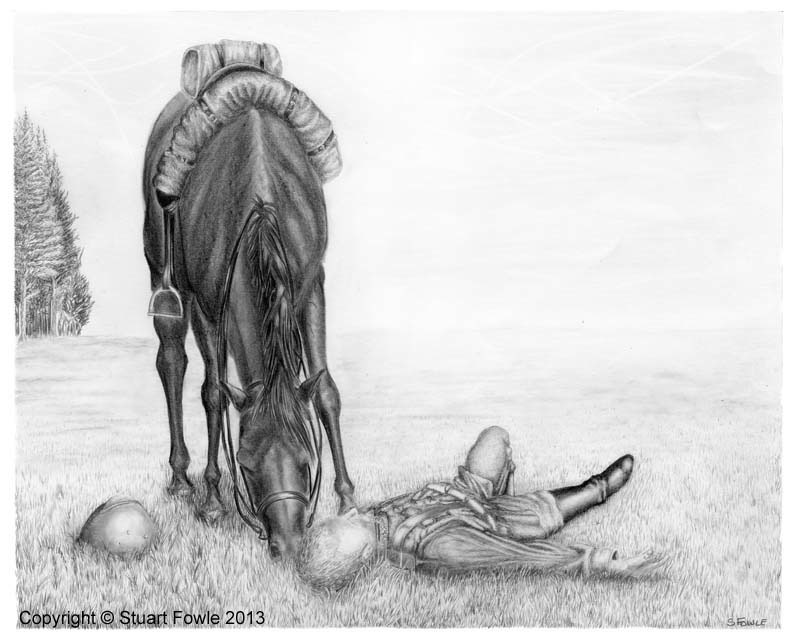 My drawing depicts a Polish cavalry soldier, who has been mortally wounded and seperated from his unit. He has laid down to 'rest' with his faithful mount nudging his head. While in the skies of his beloved Poland, all he can see is the contails of his hated enimies. Poland gave so much in WW2, and lost even more, even in victory in 1945. 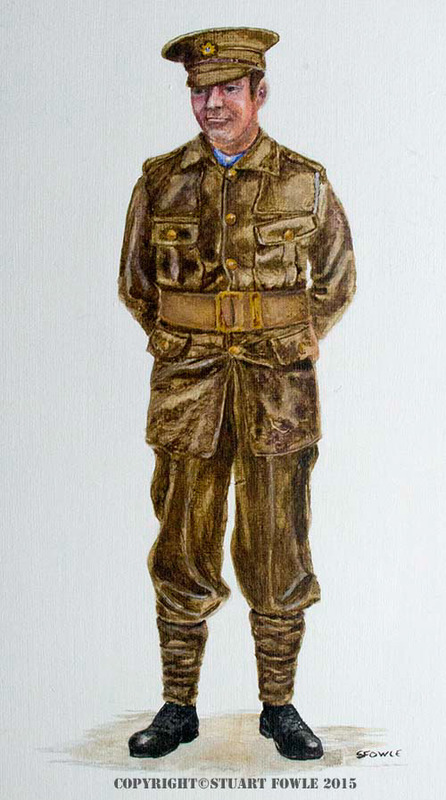 A typical World War 1 British 'Tommy' of the Devonshire Regiment. Image painted in acrylic on canvas board.